Christine James – also a well-established non-fiction writer, under a separate name – is a novelist who sets her books in the evocative Fenland countryside of South Lincolnshire. With In the Family, she launched a crime series featuring Detective Inspector Tim Yates. 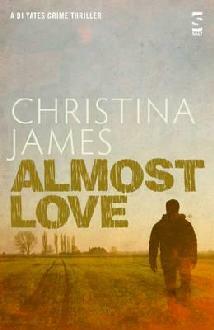 Almost Love, the second novel in this series, develops out of the disappearance of Dame Claudia McRae, the famous veteran archaeologist, who has left only a gruesome smear of blood to indicate her fate. Read on, for the opportunity to sample this compelling new crime thriller for yourself. It was the boozy night before the conference, towards the end of the evening, and Alex, who was neither sober nor completely drunk, was heading for bed. It had been a long day and she had not enjoyed the preconference dinner. She’d had to look after the speakers, an irascible bunch of eccentrics who had taken a dim view of the wine waiter’s capabilities; they’d complained to his face in loud, alcohol-charged voices that had gradually tipped over into unpleasantness. The argument was about credit cards. Alex had been sitting at the far end of the long speakers’ table, and she hadn’t caught the start of it. The waiter, a youth of about nineteen, was standing there stolidly, holding the card machine in his hand and woodenly absorbing their opprobrium . Nevertheless, Alex was afraid that someone from the hotel management would come diving into the fracas and there would be a scene. Without enquiring what exactly had gone wrong, Alex had smoothed things over by herself paying for their wine. As she was keying in her PIN, the thought had crossed her mind that their indignation might have been a ploy to get the extra alcohol buckshee. She dismissed it as uncharitable – less because she did not think that it might be true than because she did not want to descend into a depressed state of cynicism ahead of two days in the company of these people. She had intended to leave the hotel dining-room immediately dinner was over and headed for the shallow staircase that led past the maitre d’s desk to where the lifts were. Oliver Sparham suddenly emerged from the small bar where everyone was now gathering. He was one of the more civilized delegates whom she had managed to bounce into acting as conference chairman on the following day. Grasping her elbow, he asked her if she would join him for a drink. She was both too dazed and too polite to refuse; she knew that she owed him for the task that he had agreed to (and, more to the point, which he had yet to perform). She nodded consent and allowed him to steer her, still holding on to her elbow, past the knot of people gathered at the bar’s double doors and into the inner drinking sanctum itself. She knew that many of the conference delegates would now be ensconced in this room until the hotel closed it at 2 a.m.; she was determined not to be among them. At least these words gave her an excuse to shake him free. Her mind was fuzzy with wine and fatigue. What could she ask for that would not give her a blinding headache the next day. ‘Prosecco,’ she said. ‘Just a small one.’ She tried to smile at him. He nodded and trotted off, his face pink under the lights, his spectacles gleaming, evidently unaware that her response was barely lukewarm. She knew it was not Oliver before she looked up; glancing across at the bar, she saw that he was still queuing and some way from being served. She had not recognized the voice, however, so when she turned to meet the eye of her new companion she was surprised to see that it was Edmund Baker, the Heritage Officer forSouth Lincolnshire and currently Honorary President of the Society. His voice must have sounded strange because he’d been drinking. She sighed inwardly. Edmund was famous for being a bore when he was sober; when he was drunk, his stupor-inducing talents were almost legendary. He wrinkled his long nose rather comically. ‘So-so,’ he said. ‘I got saddled with Lois Merton. Not much of a looker, is she? Even if she has got the equipment up top.’ He mimed two enormous breasts, accompanying the gesture with the exaggerated leer of a schoolboy. ‘Really, Edmund, that is a disgraceful comment. I’d rather you talked to someone else if you can’t behave any better.’ She smiled, though, in spite of herself. ‘Yes, ma’am,’ he said, pulling another schoolboy face. His hair was silver-white. Alex wondered what colour it had been in his youth. She guessed sandy, which meant that he probably hadn’t been as attractive then as he was now. She gulped inwardly. Had the thought just flitted through her brain that Edmund could be in any way attractive? She’d always found him difficult to deal with and very boring on occasions; and actually quite asexual. When Oliver came back with her drink, she would down it as quickly as she decently could and go to bed. Her judgment had been impaired by the booze. ‘What’s up?’ said Edmund. He was evidently in a good mood. She saw that he was clutching a large scotch. ‘Nothing,’ said Alex. ‘I’m just tired, that’s all.’ She cast around for something to talk about. Afterwards, she could never quite understand why she had shared her pet project with Edmund. Edmund looked at her for a long moment, swirling the scotch in his glass as he did so. Alex was taken aback. She tried to think quickly. Edmund was much older than she was – as he said, he was close to retiring, which made him more than twenty years her senior – and, although she’d long dreamed of setting up a sort of research consultancy for archaeological projects, she’d always thought that if she made a go of it, it would be a business that Tom might like to work in as well. Even Tom couldn’t spend his whole life doing social work. But, counter-intuitively, she suddenly found something appealing in the idea of working with Edmund. Oliver came back with their drinks before she could reply. Edmund launched himself to his feet, swaying a little. He turned his back. Oliver handed Alex her glass of Prosecco, pulling a face as he did so. ‘He hasn’t been here for very long, and actually he hasn’t been boring me at all.’ She meant to sound surprised, but she realized as soon as she spoke that she had delivered the sentence rather aggressively. ‘Oh. Well, to quote Edmund, “Don’t let me interrupt anything.” If you’re happy talking to him, I’m quite willing to leave you two alone. I have no wish to play gooseberry,’ he added, smirking slightly. ‘Especially Edmund what?’ said Edmund, returning in triumph with a spindly gilded chair that looked as if it would not take his weight. ‘Nothing,’ she and Oliver said together. They both giggled. ‘I see. Talking about me behind my back, were you?’ said Edmund. He spoke genially, without rancour. Alex reflected that she had never seen him in such a good mood. Oliver launched into test-delivering a series of little vignettes that he had prepared by way of introducing the speakers the next day. Alex thought that they succeeded in being quite as humorously malicious as he had intended, but she could hardly concentrate on what he was saying and she wished he would lower his voice; she knew that his performance tomorrow would fall flat if too many people overheard in advance what he was planning. Edmund didn’t contribute to the conversation at all, which was unlike him, but she was grateful for it. She knew that he could be both rude and tactless if he was feeling cantankerous. But he continued to swirl the whisky in his glass, smiling and nodding almost beatifically. Afterwards, it occurred to her that he had been very drunk. She herself was quite drunk by this time. The room had taken on a surreal quality; voices rushed at her and then retreated; a wicked little pang that she’d felt in her forehead while she was shredding the beer mat was growing into a Goliath of a headache. Her replies to Oliver, as he showed off his genial but lethal character-assassination skills and asked mock-modestly for reassurance that he was delivering ‘what she had anticipated’, became ever more perfunctory. Edmund continued to grin and swirl, and then suddenly downed what was left of the whisky. ‘Anyone want another drink?’ he asked. Alex watched Edmund’s eyes widen and knew, with a shock, that he thought that Oliver was trying to proposition her, whereas she was quite certain that all he meant to do was release her from Edmund so that she could go to bed; her own bed, in the magnificent suite that was always allocated to her in recognition of her hard work in organizing the conference, but which she barely saw because her every waking hour had to be spent elsewhere. It was because she could not bear to give Edmund grounds to believe this inference that she made herself accept his offer of yet another drink. Oliver stood up and made a waving gesture. Edmund also stood, swaying even more than when he had first approached her. Alex nodded weakly. Her evening was turning into a disaster, yet one from which she felt powerless to extricate herself. She knew that tomorrow she would feel sick and hungover and that, when she got up, the day’s programme of conference presentations and ‘gala dinner’ would seem to drag on endlessly before she could crawl into bed again. She desperately needed her bed now, but getting to it seemed harder than walking through a maze for the first time. Edmund came back with a much larger glass of Prosecco than the one that Oliver had bought and what seemed to be at least half a tumbler of whisky on the rocks. He sat down heavily. She took the glass of wine from him and sipped it. He started talking about her idea again. Alex said little, but took a few more sips of the wine. Miraculously, the pain in her head lifted.